The planet Mercury shows us how we think best. The ancients understood Mercury to be ‘the thinking soul’ while 17th century master astrologer William Lilly saw it to represent thought as ‘awareness’. Thought, perception, communication… Mercury reflects our mindset and entire thinking apparatus including our nervous system, which binds the brain to the body. If you have Mercury in either of the signs it rules, Gemini or Virgo, you’re more often than not a logical thinker. The sign of Gemini brings out the communicative and rational side of Mercury (think of the winged messenger of the gods in Greek myth), while Virgo brings Mercury’s discriminative and knowledge gathering qualities to the fore. Mercury not only rules but is also exalted (“honored”) in Virgo. This makes it strong but may cause it to operate inconsistently (and nervous tension often results). Mercury placed in a sign opposite one of the signs it rules, in Sagittarius and Pisces, feels as if it’s in a foreign land and is said to be detrimented. In Sagittarius Mercury can be inspirational and quick – too quick sometimes! In watery Pisces Mercury may wander, struggling with an A to Z linear approach. People with these Mercury placements do well in vocations which require thinking outside of the box. Where’s your Mercury? Is it in an earth, air, fire or water sign? Does it lend you to be subtle, elegant and discrete, or a boaster, a prattler and a tale-carrier (Lilly)? Does it serve your core identity, helping you to perceive the world and align it with your will? Or is it in a different sign to your Sun, giving you a multi-dimensional approach to your awareness? 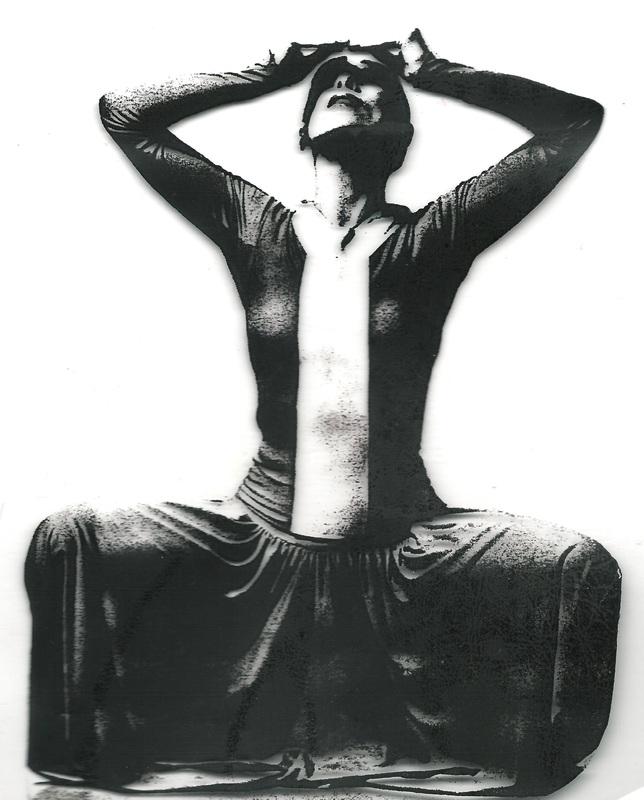 We continue our look at innovators of the 20th century who have Aquarius on the Midheaven (previous posts include Neil Armstrong and Martha Graham). One of the most influential architects of the Modern Movement, Le Corbusier sought simplicity and order in his designs, rejecting the concept of ‘style’. A product of his age, he believed that a house ought to be conceived, designed and produced in a rational manner, as were cars and airplanes. Traditionally designed houses seemed to frustrate the promise of the new machine age and the “good life for all” that technology could bring. The Sun-Moon blend is Libra-Gemini – strong social energies combine with mind-power as these two air signs come together. Looking at the horoscope above, note how the Sun is electrified by Uranus, and the Moon is both empowered by Pluto and sensitized by Neptune. We immediately feel the promise of something on a monumental scale, of someone with a grand aesthetic statement to deliver to the world. Innovator Uranus not only rules the 9th House (internationalism) and the all-important Midheaven but is oriental and tightly conjunct the Sun, ruler of both the 3rd House of communications and the 4th House of architecture. 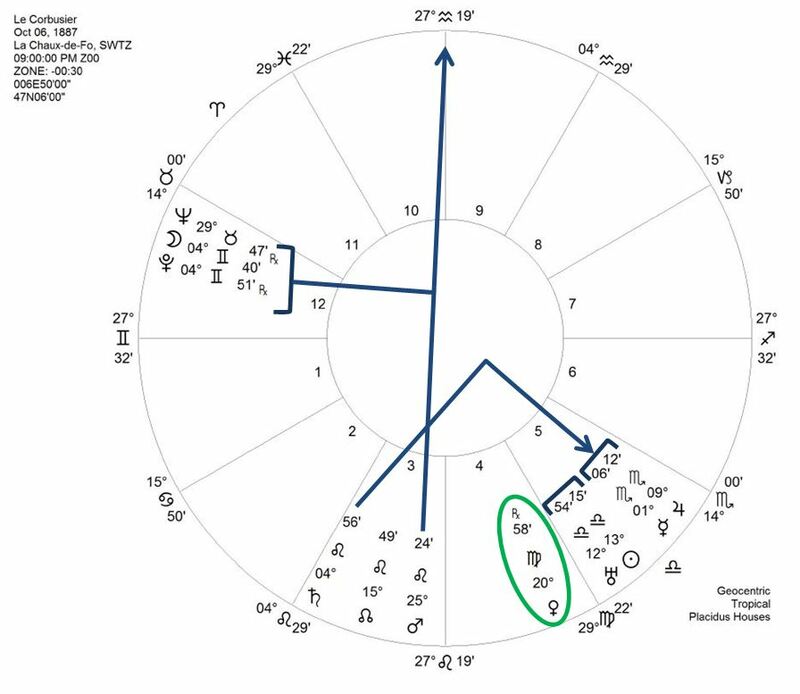 Uranus and the Sun sit in the 5th House of creativity and are disposited by Venus in detail-orientated Virgo, co-ruler of the 5th (with Mercury) and ruler of the 12th. Venus in the 4th is also peregrine (defined here as not forming any Ptolemaic aspect with any other planet*) so we know that aesthetic expression will not only be idiosyncratic but will flood the horoscope with its significance, seeking constant affirmation through creative output (5th) and collective socio-political dreams (12th). Add to this the natal Midpoints AP=Ve/Ur and Ve=Ur/MC and we feel aesthetic innovation at fever pitch. Mars in Leo, on the cusp of the 4th House and reaching up to the Midheaven, roars out to be heard! Here we see the drive for recognition and the charismatic ego strength to be the front man for the Modern Movement. Le Corbusier strove for personal glory while simultaneously serving the social collective and becoming of indispensable social significance. Returning to the 5th House, we find Mercury (the Ascendant ruler) and Jupiter here, both in highly-driven Scorpio. The pair is squared by Saturn, traditional ruler of the Aquarius Midheaven and astrological ruler of Ferro-concrete, Le Corbusier’s signature material. We feel the cerebral thoroughness and sense of purpose for which he became a twentieth century architectural icon. Pluto and Mercury, both contacting the Midheaven, are in mutual reception, linking the 5th and 6th Houses strongly together through rulership. Once again we feel the grand scale of Le Corbusier’s mental perspective. The 12th House emphasis, with big brothers Neptune-Pluto flanking the Moon (and powerfully squaring the Midheaven), call down images of the large scale and governmental nature of many of Le Corbusier’s designs, such as the Swiss Students’ Hostel (1930-32), the Unité d’Habitation (1946-52) in Marseilles and his contemporary city for three million inhabitants (never built). With many of his designs there is a “pie-in-the-sky” element (Ur=Ma/Ne); for example, despite its enormous visual impact, the corridors of the Unité housing space ended up being dark and gloomy with some of the inner bedrooms cupboard-like and airless. Its impressive scale scared people and its rough, chunky, untreated concrete walls gave it the air of an ancient ruin. Needless to say, he never realized his ambition to build a series of Unités 200 meters apart in a “Radiant City”. Interestingly, it was when he was not trying to be a social engineer that Le Corbusier built some of the most beautiful and inspiring buildings of his age. The Chapelle Notre-Dame-du-Haut de Ronchamp, also known as the Chapel at Ronchamp (1950-55) marks his distinct break with socialistic and mechanistic architecture and his embrace of more primitive and organic forms. The major part of his design work for this project was carried out during solar arc Neptune conjoining his natal Saturn and transiting Saturn conjunct his Sun. Uranus arced to his Moon by quindecile at its completion. À la vôtre, Le Corb! Charles-Édouard Jeanneret-Gris, known as Le Corbusier: born October 6, 1887 at 9pm in La Chaux-de-Fonds, Switzerland; died August 27, 1965, in Roquebrune-Cap-Martin, France, at age 77. 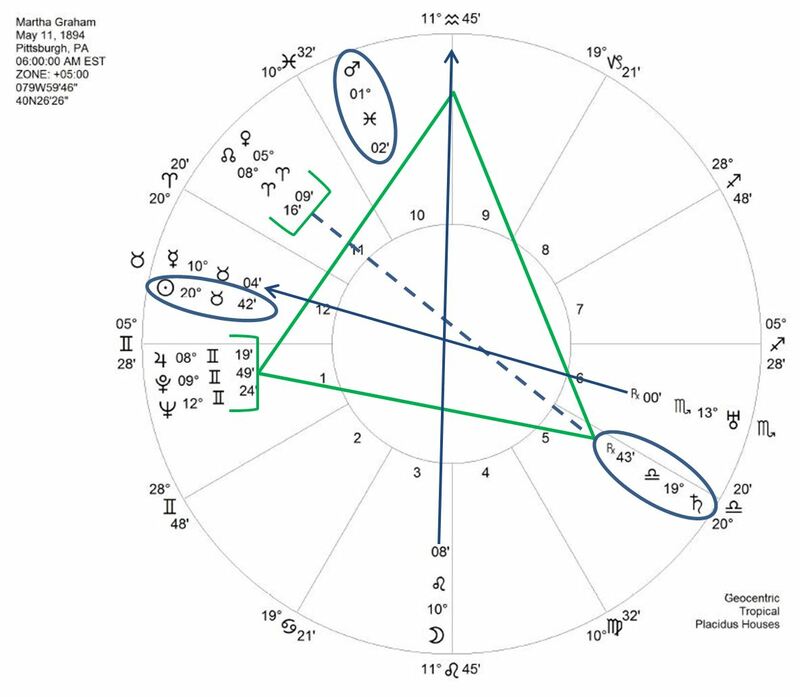 Written on the Fall Equinox of September 22, 2014, with transiting Pluto stationing direct and square Le Corb’s Sun and Uranus, and transiting Jupiter conjunct his Nodal Axis, Pluto=Sun. Every horoscope has an archetypal essence, the symbolic story which manifests in an ordinary or an extraordinary life. 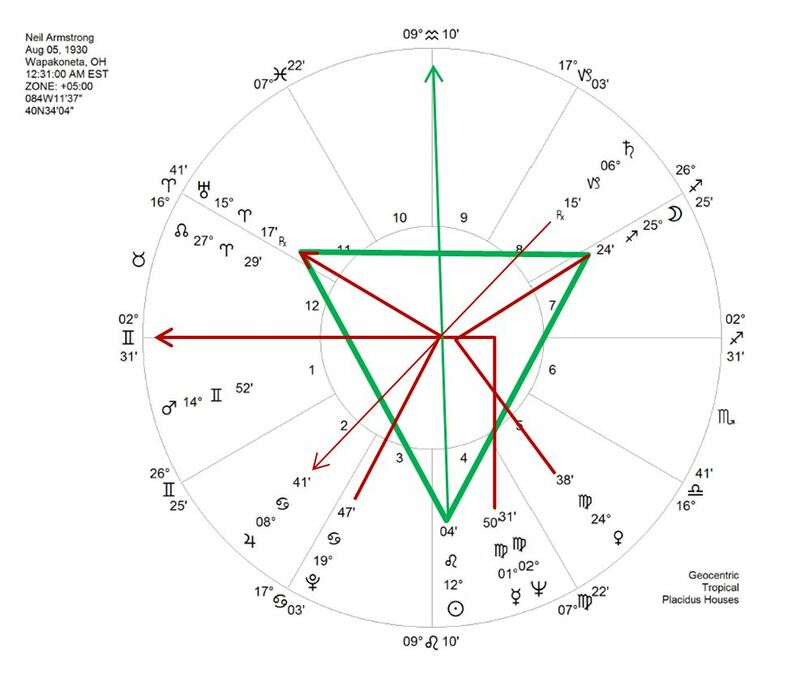 Neil Armstrong’s birth chart shows the Sun in Leo and the Moon in Sagittarius, a fiery combination promising daring feats, travel and adventure to achieve ego recognition. The challenge for this combination lies in reigning in the emotional nature, or, as Grant Lewi warned, the danger is that one might become “a useless wanderer in the skies”. While Armstrong might have wandered our skies, he was never useless. His service to his country began with 72 combat missions over Korea in the early 1950’s and ended when he left NASA in 1971 to become Professor of Aeronautical Engineering at Cincinnati University. The constructive life lived by Armstrong was both disciplined and humble. He never displayed any “outer fire”, as his brother Dean (and countless others) have acknowledged. Filled with inner restraint, and unwilling to capitalize on his fame of being the first American to walk on the Moon, he led as quiet a life as anyone could who had achieved such global recognition. How do we see this in the horoscope? Firstly, the Sun, the Moon and Uranus are in a loose Fire Grand Trine – a closed circuit of motivational self-sufficiency (Tyl). This structure is often present in the horoscopes of those who have been ignored by a parent when young; the fear of being ignored develops into behaviors of self-containment. These behaviors, like grooves scored over time, tend to become routinized, leading to isolationism: “I know where I’m headed and I don’t need your help getting there!” becomes the mantra in adulthood. Armstrong’s fiery Sun and opinionated Moon were indeed symbolically self-contained; he trained himself since boyhood to require only his own stamp of approval, not the approval of others. Secondly, we see Saturn retrograde in Capricorn in the 8th House, ruling the 9th (the 12th of the parental 10th). We suspect a legacy of inferiority feelings taken on in the early home life through the relationship with the father, who was either absent, passive or tyrannical, so as not to have given the guidance of authoritative love (Tyl). Indeed, Neil’s father, Stephen Koenig Armstrong, was “a product of the ‘old school’ of stern parenting” and his job kept him away from home most of the time. As his sister June recalls, “One of his favorite phrases was, ‘Straighten up!’” When asked if Neil and his father were ever close, she replied, “No, they weren’t close…Neil probably was never hugged by him and Neil didn’t hug, either.” (Hansen, First Man: The Life of Neil A. Armstrong). Did Stephen Armstrong ever say to his son, “Neil, I love you. I’m so very proud of you, my son”? The barren relationship between himself and his father undoubtedly drove Armstrong on to achieve. We see the unspoken tension between them symbolized by Pluto, co-ruler of the 6th, square Uranus, ruler of the 10th. The horoscope keys more – a confusion surrounding being lovable which affects the self-worth. Neptune, ruler of the 11th House of love received and hoped for, is conjunct Mercury, ruling both the Ascendant, the 2nd House of self-worth, and the 5th House of the ability to give love. With Neptune and Mercury in the 4th (home), both squaring the Ascendant, we know that something was other-than-it-seemed for young Armstrong. Indeed, we discover that he was close to his religious mother (the Node quintile Jupiter, trine the Moon, Mercury and Neptune and semi-square Mars), who “thrived on goodness” and whose discipline style was not physical but moral (Hansen). She was the head of the home in his father’s absences. The Moon is pushing in to the 8th House, hiding from the limelight; it is squared by Venus ruling the 6th and 12th. Here is another clue as to why Armstrong would naturally shy from the glare of publicity and keep his emotions under wraps. Hansen writes that Armstrong developed his conflict-avoidance strategy initially in relationship to his mother, who would so often lecture him on religion. According to his brother, Armstrong would listen politely and in silence, saying nothing unless pressed. His love of science and reason had already, at a young age, led him to believe that God was to be found through the understanding of natural laws rather than in a church. This chaffed at his mother. Armstrong was “contained” within his Grand Trine from the beginning – a reaction to defending his inner security from both his religious mother and his stern, largely absent father – and found no need to step out of it, making him the ideal “cool-headed” astronaut commander we remember. With Saturn opposing Jupiter, ruler of the 7th and 8th, our attention is called to mark Armstrong’s strong sense of purpose, which served to further anchor his Sun-Moon blend. Pluto, ruler of space flight and exploration, is quindecile (165 degrees) Saturn. Indeed his work (Pluto co-rules the 6th) was characterized by his intense focus, even obsession, with all things aeronautical and international, or, in this case, universal. We see Mars in Gemini in the 1st and the Midpoint Pictures Mercury=Ascendant and AP=Mercury/Node. With Neptune closely conjunct Mercury, ruler of his Gemini Ascendant and one of the three final dispositors in his horoscope, he was able to fly beyond the bounds of his own mind and embrace the possibility of walking on the Moon. We also feel the potent Midpoint Picture Pluto=Sun/Moon, which so often signals transformation and breakthrough as a life development theme. He was clearly pushing all previous boundaries hitherto known to humanity in his work. On a personal level, it is known that he suffered deeply and was forever changed by the death of his young daughter in January 1962 (transiting Neptune square the Sun, ruler of the 4th). Looking further, we see Armstrong’s Sun (archetypally, Apollo) in Leo reaching up to the Midheaven for fulfillment. His Sun is trine to Uranus (aeronautics), ruler of the Midheaven, and sextile Mars. Mars and Uranus are also sextile each other and Uranus contacts Mercury, the Ascendant ruler. We are alerted to science and technology, the science of flight. And with Uranus “pushing in” to the 12th House, ruled by Mars, government comes to mind. Armstrong was to find his “place in the Sun” working as an aeronautical research pilot and a command pilot in the space programs Gemini and Apollo for the US government. His humility and emotional containment, developed in his early years in reaction to his parents’ ways, served him well in the incredibly stressful settings in which he found himself during the NASA years. Whether he was ever able to enjoy the fruits of his labors or to have a satisfying personal relationship, is a real question. Perhaps there was simply too much self-containment for him to be intimate with another human being. Such is the making of a hero.